The book is out now, and it’s a good read for anyone interested in exploring the current landscape of social media technologies. Read on for more of my thoughts, and to see what I wrote in the Foreward. John K. Waters, the author of the book, has been writing about technology for about 20 years. 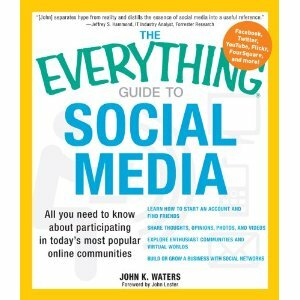 In this book he takes a very comprehensive approach to exploring all the different social media technologies and how to best use them. John’s writing style is nice and conversational, and this is exactly the kind of book I would give my Mom to help her understand what’s going on with “Social Media.” That said, it’s also a great reference book for more technologically savvy folks who want a detailed yet concise summary of the social media technology landscape. You can read a full summary of the book and buy a copy here on Amazon. I did, however, write the Foreward. In it, I did my best to paint a broad picture of why social media is so compelling to us, and how it’s wrapped up in our basic human tendency to crave and create both communities and tools. My entire Forward is available to read in the “Click to look inside!” option on Amazon, so it should be Fair Use for me to reproduce it here for convenience. I’d love to hear people’s thoughts about what I wrote. And for the record, I don’t get any royalties for sold copies. I just like sharing what I feel are useful resources. This book is one of them. John, thank you again for the opportunity to write this Foreword. I think you did a fantastic job with the book, and it was my pleasure to be able to help you kick it off. dreams and goals. Together, we grow and thrive. Human beings also crave and create tools. Again, it is part of our nature as a species. we can touch the stars. things gets really interesting when communities and tools intersect. facets of their personality in virtual world environments for entertainment and work. Traditional mass media has been turned on its head. Social Media is giving every human being in modern society the tools to communicate and form communities in ways never seen before. And we face a serious challenge that has nothing to do with the technology of the tools themselves. How can we learn to use Social Media in ways that improve the human condition and our quality of life? Our information-overloaded world can drive us away from wisdom and into mindless distraction if we are not careful. ready for a fun ride, too! ultimately improve your own life and the life of others. This entry was posted in Announcements, Virtual Worlds and tagged book review, innovation, online communities, second life, social media, virtual worlds by John "Pathfinder" Lester. Bookmark the permalink. my main comment is that “mass medias owners” never sold us the “illusion” that “we” had/owned the tools to use the electronic media to mass communicate/commune. the overiding danger in “today” 2.0 “culture” is the delusion /illusion that “we the people” have any ownership or rights to the “new tools” being “sold to us” in order to PLUG INTO this new “world order’:) …. and even IF we own our own bodies(genome patents and ideas- blog IP- as well as the shelter/water we need just to survive. Social Democracy better find a way not to be “old drivel socialism”= Red Scare realities- other wise Social media is just another Slavery 2.0 with a shinier name and an Edleman Publisist. chat among yourselves….. coffee ,darlings? I totally agree with you that social media has turned traditional media on its head. I was in China during the big earthquake a couple of years, and Twitter changed the way that people learned about the quake. Sure, journalists were able to track down people in real time to interview them about what was going on. But average citizens could do the same, and follow the event — and the government reaction to it — as it was happening. The geographical barriers disappeared. People were posting quick messages, images, even entire videos. Social media transformed how China and other government react to disasters. And this is only one example, just a small fraction of what will happen as this platform evolves.